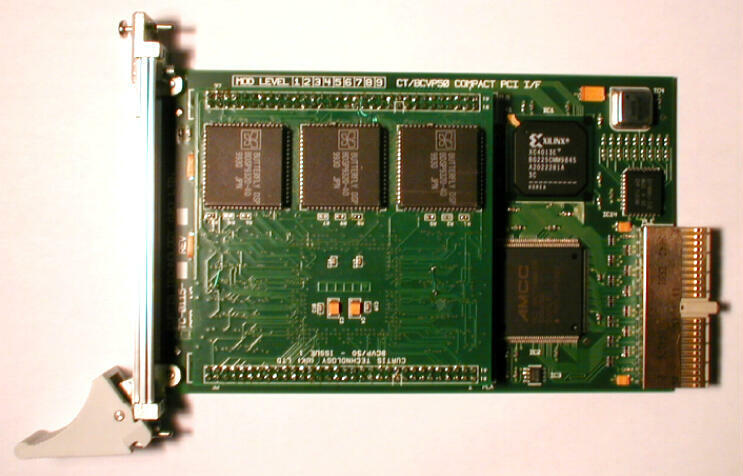 Designed and built in house by Curtis Technology, this CPCI card processes the data received from the TAXI Interface card. The BCVP interface card consists of the main PCB plus a CT-BCVP/50 daughterboard. The main PCB handles Compact PCI bus management, whilst the daughterboard performs the Sonar 2031CT data processing The CT-BCVP/50 is a compact PCB module based on the Butterfly DSP BDSP-9124 family of integrated circuits from Sharp Microelectronics Technology, Inc. The module, 3.5 inch square by 0.25 inches thick, provides the highest performance FFT capability in the smallest volume of any FFT-based DSP module or board available from commercial sources. The BDSP-9124 uses a four port bi-directional data flow architecture that allows high speed RAM to be used for working data and coefficient storage, and high speed FIFOs for input/output data queuing. The module has been designed to handle large transform sizes relatively easily. Up to 48 megabits of memory are used to support the DSP chip, three data ports each interface to up to 256k complex words of RAM, whilst a fourth port interfaces to a 256k complex word bi-directional FIFO for data I/O. The CT-BCVP-50 daughterboard integrates one BDSP-9124 processor, together with three memory controllers and 4.5 Mbytes of high speed RAM. The processor supports 24-bit block floating point precision and calculates transform sizes from 2 to 256k points, as well as a wide range of other complex vector operations.